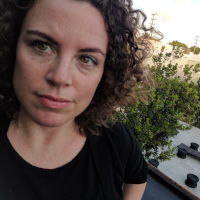 Most recently known as Lead Writer for Shadow of the Tomb Raider with Eidos-Montreal, Jill Murray won a Writer's Guild of America Award for Excellence in Videogame Writing for her work on Assassin's Creed: Liberation with Ubisoft in 2013. She also contributed to Assassin's Creed: Black Flag, and Freedom Cry. In 2015, she founded game narrative studio, Discoglobe Interactive, to work with a wider range of games, both indie and AAA, including VR experiences, text adventures, dating sims and rpgs. In past lives, Jill studied theatre, worked as a web developer, and published two YA novels about break dancing teenagers. She has taught game design at Champlain College, given workshops in writing and narrative design in Montreal, and appeared internationally as a speaker at Gamescom, SDCC, E3, Tribeca Film Festival, GDC, the Perth International Writers' Festival, East Coast Game Conference, and Montreal International Game Summit.